I wish to express my gratitude to Dr. Rainer Riesner (University of Tüubingen) and his wife Cornelia for their help with this article. 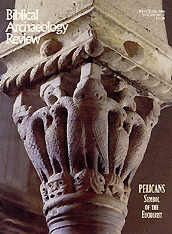 For further information see Bargil Pixner, "Jerusalem's Essene Gateway" BAR, May/June 1997; Hershel Shanks, "The Tombs of David and Other Kings of Judah," Jerusalem: An Archaeological Biography (New York: Random House, 1995), pp. 35-43. Also see the Question and Answer article with Bargil Pixner concerning this topic. I BELIEVE that the famous Church of the Apostles, intended to mark the site where the apostles prayed when they returned from the Mount of Olives after witnessing Christ's post-resurrection assent to heaven (Acts 1:1-13), can still be found on the southwestern hill of Jerusalem, today called Mt Zion. This was also the traditional site of the Last Supper. There too Peter delivered the famous Pentecost sermon that is recorded in Acts 2. Paradoxically, what remains of the Church of the Apostles is now part of the structure traditionally venerated as the tomb of King David. The second floor of this structure, however, is still revered as the cenacle, the traditional room of the Last Supper. Our demonstration is in three steps. The first one is the easiest and is not really disputed by any serious body of scholarship. That is, that the structure in which the traditional tomb of David is located on Mt. Zion is really a Roman-period synagogue and not the tomb of David. The second step in my argument is that this was not a usual Jewish synagogue, but a Judeo-Christian Synagogue. At first, places where Jewish Christians worshipped were of course called synagogues. Only later, as I will explain, did Christian places of worship come to be called churches instead of synagogues. And at some time after that, this particular Judeo-Christian synagogue became known as the Church of the Apostles. Demonstrating this last statement will be the third part of my argument. If you ask a policeman in Jerusalem where Mt. Zion is (or look on a map), he will direct you to a broad hill south of the walled Old City. There are, in fact, two hills that extend south from the Old City, divided by the Tyropoeon Valley. The western hill is what is today called Mt. Zion. The western hill is much larger, broader and higher; the eastern hill is narrower, lower and steeply sloped. Until about 100 or 150 years ago, scholars were generally agreed that this western hill was where the City of David had been located. So there was little reason to question the traditional site of David's tomb on Mt. Zion. But then the early explorers and archaeologists got into the act. In 1838, the American Orientalist Edward Robinson crawled through a fantastic tunnel under the eastern hill that carried water from the Gihon Spring on the eastern side of the eastern hill to the other side of this hill. What was this tunnel doing under the eastern hill? In 1880, an ancient Hebrew inscription found carved into the wall of this tunnel helped the German architect Conrad Schick to identify the tunnel as the one that Judah's King Hezekiah constructed to bring water into Jerusalem, in the late eighth century B.C., in anticipation of an Assyrian siege, as described in the Bible (2 Kings 18:13-19:37; 2 Chronicles 32). But the mystery deepened: What was all this doing under the eastern hill? A subsequent century of excavation has now conclusively established that the Canaanite (or Jebusite) city that David captured in about 1000 B.C. and that then became known as the City of David (2 Samuel 5:7) was on the eastern hill, not on the western hill. 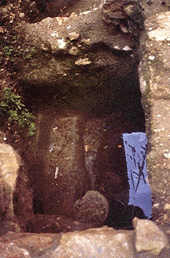 The reason why is clear: The abundant waters of the Gihon Spring flow at the base of the eastern hill. Today, the western hill is still called Mt. Zion, but the eastern hill is known as the City of David. King Solomon, David's son, built his palace and a Temple to the Lord on a hill north of King David's city, on what is today still called the Temple Mount, the jewel of the Old City, with the Dome of the Rock at its center. Even in Biblical times, the site of Zion seems to have shifted, for the Temple Mount became known as Zion (Zion II). This shift to the Temple Mount is already noticeable in Isaiah (for example, Isaiah 60:14) and in the Psalms, but is especially clear in the First Book of Maccabees (4:37,60, 5:54, 7:33). So it remained until the Roman destruction of Jerusalem in 70 A.D. At that time, the Romans utterly destroyed the city, including the Temple, and in time people wondered where the ancient Davidic fortress could have been. First century residents of Jerusalem could not imagine the splendid palace of David having stood on the lowly eastern hill. Common opinion held that it must have stood on the highest hill of the city as they perceived it, the western hill. The first-century Jewish historian Josephus already refers to the City of David on the western hill.3 In this way a third place, the western hill, became known as Mt. Zion (Zion III), which name it still retains, although erroneously. 3 Josephus thought that the ancient wall (First wall) encompassing the western hill had been built by David and Solomon (The Jewish War 5.143). Describing David's conquest of Jerusalem, he lets Joab first conquer the Lower City, then the Jebusite fortress in the Upper City (Jewish Antiquities 7.62-66). 4 Raymond Weill, Le Cite de David, 2 vol. (Paris, 1920 and 1947); and Hershel Shanks, The City of David: A Guide to Biblical Jerusalem (Washington: BAS, 1973), pp. 99-108. 5 Nehemiah tells us that "Shallum rebuilt the Fountain Gate" and then "built the wall of the Pool of Solomon at the royal garden as far as the stairs that go down from the City of David" (Nehemiah 3:15). This clearly places the City of David on the eastern hill. The next verse contains the description of a portion of the wall repair "opposite David's tomb." The tomb of David must have lain inside the city wall, not far from the Siloam Pool, yet still at a distance from the Temple Mount, precisely where the tombs Weill found are located. 6 Jewish Antiquities 7.393; 16.179-183. 8 Tosephta, Baba Bathra 1: II; Jerusalem Talmud, Nazir 57d. Like Zion, David's tomb also did some moving about. The French archaeologist Raymond Weill, excavating on the eastern hill in 1913, uncovered a number of cave tombs, including three beautiful horizontal gallery-graves.4 Weill believed he had uncovered the royal necropolis within the City of David. Many archaeologists still agree. But if this is not exactly where David was buried, his burial must have been elsewhere in the City of David � on the eastern hill. Josephus reports that Herod the Great (37-4 B.C.) secretly tried to rob the treasure hidden in David's tomb. When two of Herod's clandestine diggers met a mysterious death, fear overcame Herod and he ordered a tomb-memorial erected at the site.6 This memorial is no doubt what Peter is referring to in his great Pentecost sermon (Acts 2) when he says that "[King] David's tomb [Greek, mnena] is with us to this day" (Acts 2:29). The last person we know of who knew the exact location of David's tomb was Rabbi Akiva. Eventually executed by the Romans for his support of the Second Jewish Revolt, Akiva was once asked why the graves of the Davidic dynasty were allowed within the city walls despite the fact that this would cause an area to be impure. He responded that the impurity of the graves was led out of the city through a rock channel into the Kidron River.8 This is important because the Kidron lies on the east side of the eastern hill. It clearly indicates that he placed the royal tombs on the eastern slope of the eastern hill close to the Kidron Valley, just where Weill discovered the tomb complex. Akiva's testimony provides an additional reason to believe David's tomb was on the eastern hill. After the Roman emperor Hadrian suppressed the Second Jewish Revolt, Jews were banned from the city. Jerusalem was rebuilt as a Roman colony called Aelia Capitolina. For that purpose the area of the "royal tombs" found by Weill on the eastern hill was used as a quarry. 9 J.P. Migne, ed., Patrologia Graeca (Paris, 1844), vol. 43, p. 420 (hereafter cited MPG). 10 Donato Baldi, Enchiridion Locorum Sanctorum (Jerusalem: Franciscan Printing Press, 1982; reprint of the 2nd edition of 1955), no. 96. 11 John Wilkinson, Jerusalem Pilgrims Before the Crusades (Jerusalem: Ariel, 1978), p. 85. 12 Ali Harad (1170 A.D.) states: "Beit Lahem (Bethlehem) is the name of the town where Jesus was born � peace be with him � and where there are the tombs of David and Solomon" (Archives de I' Orient Latin 1, Paris 1881, p. 605). Ibn Khaldun (14th century) writes in his history: "Then David, the prophet, died and was buried in Bethlehem" (F. Dunkel, Das Heilige Land 55 , p. 25). 13 Baldi, Enchiridion, no. 754.
a In translations from Greek or Latin, "Zion" (Hebrew) is spelled "Sion." 14 Raymund de Aguilers writes: "In that church are the following holies: the sepulchre of King David and of Solomon and the sepulchre of the proto-martyr Saint Stephen" (Baldi, Enchiridion, no. 757). b It is still there, rebuilt on the grounds of the École Biblique. Some parts of the original church, including part of the mosaic pavement have survived. Moslems continued to venerate the tombs of David and Solomon in Bethlehem until the 14th century,12 though in the tenth century a new Christian tradition had begun to develop that placed David's tomb on the western hill, which had long been identified, if incorrectly, as Mt. Zion. The Crusaders disregarded the tradition concerning Stephen's tomb, because a Byzantine Church of St. Stephen containing a reliquary of the martyr already existed north of Damascus Gate.b The Crusaders focused their attention instead on the tradition of David's tomb that placed it on Mt. Zion (Zion III), and they erected an enormous Gothic cenotaph (a sepulchral monument, in this case an empty sarcophagus) to mark it. But the Tomb of David was, for the Crusaders, of less importance than the much older tradition, also found by the Crusaders, that this sanctuary was the site of Jesus' Last Supper, of the resurrection appearances, of the descent of the Holy Spirit upon the apostles on Pentecost and of the dormition (passing away) of Mary. Gradually this pseudo-tomb of David of the Christians came to be accepted, first by the Jews and later also by Moslems. The site became a special point of interest for Jews during the period between 1948 and 1967 (when the Old City was in Jordanian hands), because the most revered Jewish site, the Wailing Wall (the western wall of Herod's Temple Mount), inside the Old City, was generally inaccessible to Jews, whereas Mt. Zion was under Israeli control during those years. 15 This report was only published posthumously, the author was killed in a terrorist attack on the 1956 Archaeological Convention at Ramat Rachel, south of Jerusalem. In 1948, during Israel's War of Independence, considerable fighting occurred on and around the western hill, Mt. Zion (Zion III), in the course of which a shell exploded in the building housing the traditional tomb of King David. In 1951 the Israeli archaeologist Jacob Pinkerfeld was entrusted with the task of repairing the damage. While doing so, he also examined the site from an archaeological perspective.15 Behind the cenotaph of King David, Pinkerfeld found a niche that was part of the original structure of the building. When he removed the marble floor slabs for repair, he dug two trial pits in which he found three earlier floor levels. About 5 inches (12 cm) below the present floor, he found the Crusader floor. About a foot and a half (48 cm) below that, he found a late Roman or early Byzantine floor that consisted of a colored mosaic with geometric designs. Then, about 4 inches (10 cm) below that, Pinkerfeld found the plaster of the original building's floor, along with the remains of what appeared to be a stone pavement. 16 Jacob Pinkerfeld, " 'David's Tomb,' Notes on the History. of the Building," Bulletin of the Louis Rabinowitz Fund for the Exploration of Ancient Synagogues, 3 (Jerusalem: Hebrew Univ., 1960), pp. 41-43. See Chart: The First-Century Judeo-Christian Synagogue As Pinkerfeld noted, in the northern wall (which was part of the original construction) was a niche about 6 feet (1.8 m) above the original floor level. Similar niches at similar heights above floor level have been found in ancient synagogues and were presumably used to house an ark for Torah scrolls. Pinkerfeld reasoned that this niche served the same function. He concluded that the building was originally a Roman-period synagogue. That this building was originally a synagogue now seems clear, and scholars who have examined the matter agree. The next step is to determine what kind of synagogue it was. Was it a traditional Jewish synagogue, or a Judeo-Christian synagogue? The earliest Christians were all Jews. Moreover, they did not regard themselves as having abandoned Judaism. Indeed, one of the earliest questions that the new religion addressed was whether gentiles � non-Jews � could become Christians or whether it was necessary to be a Jew in order to become a Christian (see Acts 15). It was, of course, Paul who became the apostle to the gentiles in the Greek world. Ultimately conflicts developed between the Jewish branch in Jerusalem and the gentile branch that developed outside Palestine. More of that later. 17 See for example, Ignatius of Antioch (Letter to Polycarp 4:2); Pastor of Hermas 43:9; Justin the Martyr (Dialog with the Jew Tryphon 63:5). To distinguish themselves from the Jews, the gentile Christians began to refer to their gatherings by the Greek word ekklesia, also meaning "assembly." This word was then applied to the gathering place and later to the church building itself. Another word for the building was the Greek kyriake, meaning "belonging to the Lord (kyrios)," from which the English word "church" is derived. Returning to the synagogue on Mt. Zion: Was it a Jewish synagogue or a Judeo-Christian synagogue? 19 Pinkerfeld, "David's Tomb," P. 43. Pinkerfeld's reasoning is based on at least two errors. Moreover, additional evidence suggests that the building was originally a Judeo-Christian synagogue. Pinkerfeld's first error is his assumption that all Christian houses of worship were oriented to the east. Actually, this became the general rule only in the second half of the fourth century, after Christianity had become the official religion of Rome. The construction that concerns us here is of a much earlier date. 20 The Greek word martyrion means that the church was standing as a "witness" of the death and resurrection of Jesus Christ. 21 Pinkerfeld, "David's Tomb," p. 43.
d The word "autocrat" perhaps refers to King David. Compare Psalm 110:1 and Matthew 22:43. 22 Bellarmino Bagatti, The Church from the Circumcision (Jerusalem: Franciscan Printing Press, 1971), p. 121. Was this directional orientation intentional? I believe it was. Would it not be logical that, after the Temple had been destroyed, Judeo-Christians, instead of orienting their synagogues toward the destroyed Temple as was the case with traditional Jews, would orient their synagogues toward the new center of their redemption, the site of Jesus' burial and resurrection? This suggestion is supported by the fact that when the emperor Constantine built the Church of the Martyrion,20 the earliest section of today's Church of the Holy Sepulchre, in 326 A.D., it too was oriented toward Jesus' tomb. Another sanctuary oriented toward Jesus' tomb, according to the Franciscan archaeologist Emmanuele Testa, was the oldest church in front of Mary's tomb, an ancient Judeo-Christian holy place in the Kidron Valley. But there is more. In the lowest layer, Pinkerfeld found pieces of plaster with graffiti scratched on them that came from the original synagogue wall. In his own words: "In the first [Roman] period, the hall was plastered. The fragments were handed over to the late Prof. M. Schwabe for examination. "21 Both Schwabe and Pinkerfeld died without publishing these graffiti. I agree with the Franciscan authors that on this basis we can conclude that the synagogue building was originally a Judeo-Christian house of worship. As we shall see, later references to the building as the "Church of the Apostles" also support its identification as a Judeo-Christian synagogue. The historical conditions after the Roman destruction of Jerusalem in 70 A.D. and some new archaeological evidence suggest the circumstances under which this Judeo-Christian synagogue was built. 24 Eusebius, Church History 3.5,2-3; Epiphanius, Panarion 29.7; 30.2,7. 25 "Ascension of Isaiah 4" in James H. Charlesworth, ed., The Old Testament Pseudepigrapha, Vol. 2 (Garden City, NY: Doubleday, 1985), pp. 161f. e The religion practiced by the Jews, even when practiced by believers in Jesus, was recognized by Roman law as legitimate (religio licita). Gentiles who became Christians, on the other hand, were persecuted until the time of Constantine (early fourth century). This might be one reason why Jewish believers in Jesus did not call themselves Christians, but rather Israelites, Nazoreans or Ebionites. This destruction, indeed, included the western hill, Mt. Zion (Zion III). In 1983, during an excavation in the Dormition Abbey, the building on Mt. Zion adjacent to this ancient Judeo-Christian synagogue, I found coins, dating from the second and third years of the First Jewish Revolt (67 and 68 A.D.), on the steps of a ritual bath (see photo at left) lying under huge layers of destruction debris, and in the remains of an oven. Thus, it is safe to conclude that the building that stood on the site of the adjacent Judeo-Christian synagogue also fell victim to the Roman onslaught. The archaeological evidence is consistent with this suggestion. On the outside face of the synagogue, at the base of the eastern and southern walls, we can see building stones of the original Roman-period building, which still exists to a considerable height. These large stones (for example, in the third course, 3 by 3.5 feet [96 by 110 cm]) are assigned by most archaeologists to the Herodian period, that is, before 70 A.D. But these stones were not originally hewn for this building. They were brought here from elsewhere and are in secondary use. This is evident because the corners of the stones were damaged during transport. Moreover, squared ashlars (large rectangular stones) of different heights were used in the same course on the eastern wall. Had this been original construction, the heights of stones in any one course would have been uniform. Someone during the Roman period (after the destruction of Jerusalem) must have erected this synagogue structure by using ashlars brought here from elsewhere. Who would have done this? I believe that the returning Judeo-Christians did it in the late first century, when they put up their synagogue on the site they identified with the cenacle (the Upper Room, where the Last Supper was held), the center of the primitive community around James, "the brother of the Lord" (Galatians 1:19). The most probable period when such an imposing structure would have been built was between 70 and 132 A.D. According to Eusebius, during those years there was a flourishing Judeo-Christian community in Jerusalem presided over by a series of 13 bishops from the circumcision (that is, Judeo-Christians).26 Early Church writers identified this Judeo-Christian synagogue as the Church of the Apostles. 26 In his own words: "And the history also contains the remark that there also was a very big church of Christ in Jerusalem, made up of Jews, until the time of the siege of Hadrian" (Eusebius, Demonstratio Evangetica 3.5, in Patristic Evidence for Jewish-Christian Sects, ed. A.F.J. Klijn and G.J. Reinink [Leiden, Neth. : EJ. Brill, 1973], p. 139). The list of bishops is to be found in Eusebius, Church History 4-5:1-4. 27 Baldi, Enchiridion, no. 733. 28 Migne, ed., Patrologia Latina (Paris, 1844), Vol. I I 1, p. 985 (hereafter cited MPL). Why was this ancient Judeo-Christian synagogue on Mt. Zion (Zion III) called the Church of the Apostles? The ancient sanctuary on Mt. Zion known to Epiphanius could only have been a Judeo-Christian synagogue, for the building of Christian "churches" was made possible only after Constantine's Edict of Milan (313 A.D.). Who built this synagogue-church � already standing on the southwestern hill in 130 A.D. � in memory of the place of the Last Supper and the Pentecost event? Some information comes from a tenth-century Patriarch of Alexandria named Euthychius (896-940 A.D.), who wrote a history of the church based on all the ancient sources that were available to him. According to Euthychius, the Judeo-Christians who fled to Pella to escape the Roman destruction of Jerusalem in 70 A.D. "returned to Jerusalem in the fourth year of the emperor Vespasian, and built there their church. "28 The fourth year of Vespasian was 73 A.D., the year Masada, the last outpost of the Jewish rebellion, fell to the Romans. The Judeo-Christians returned to Jerusalem under the leadership of Simon Bar-Kleopha, who was the second bishop of Jerusalem after James, "the brother of the Lord," and, like Jesus, a descendant of the royal Davidic family. 29 Charlesworth, Old Testament Pseudepigrapha, p. 736. 30 Chariesworth, Old Testament Pseudepigrapha, p. 386.
f In Eusebius' time, Mt. Zion was south of the Roman colony Aelia Capitolina, the name given to Jerusalem by Emperor Hadrian, who rebuilt it as a Roman City. 31 Baidi, Enchiridion, no. 728. Was this passage in condemnation of the effort of the Judeo-Christians who built the synagogue on Mt. Zion to transfer some of the holiness of the destroyed Temple to their place of worship on the new Mt. Zion by constructing it in part with stones from that Temple? From this time on, the western hill of Jerusalem was referred to by Christians as Mt. Zion (Zion III). Very few places in Jerusalem can point to such an enduring tradition as Zion's claim to be the seat of the primitive church. No other place has raised a serious rival claim. 32 Baldi, Enchiridion, nos. 729, 886. 33 See Herbert Donner, Die ersten Pahtinapilger (Stuttgart: Catholic Bibelwerk, 1983), pp. 41f. In the opinion of some scholars, the Bordeaux Pilgrim may have been a Jewish Christian,33 who was well versed in the Hebrew Scriptures and who was drawn to places connected with Jewish history. The synagogue that he saw on Mt. Zion could only have been a Judeo-Christian one, because he himself mentions that at this time Jews were allowed in Jerusalem only once a year to lament the destruction of Temple near a "perforated stone" in its vicinity (most probably the perforated rock [sahne] under the Dome of the Rock). Since we know of no other synagogue building standing at the pilgrim's time on Mt. Zion, the synagogue he refers to must be identified with the building we have been discussing. This same Judeo-Christian building, called a synagogue by the Bordeaux Pilgrim, was called a church by others (for example, Epiphanius) when seen from a different perspective. Another piece of evidence for the identification of this building comes from the pen of a man whose name is easily confused with the tenth-century Euthychius, quoted earlier. I refer now, however, to a man named Eucherius, who wrote in about 440 A.D., 500 years before Euthychius. Eucherius was a very learned man, originally a Roman senator and then archbishop of Lyons in France. 34 Baldi, Enchiridion, no. 735. 35 Baldi, Enchiridion, no. 730. 36 Eusebius, Church History 3.11, 32:4ff. The puzzling and somewhat difficult expression "in reverence to the place of the resurrection of the Lord" might indicate the synagogue's orientation towards Jesus' tomb in the Holy Sepulchre Church, which was also the site of the resurrection. In 348 A.D., just a few decades after the Roman emperor Constantine declared Christianity a licit religion, thus allowing it to develop freely, Cyril, later bishop of Jerusalem, delivered a famous sermon in the newly constructed basilica of the Holy Sepulchre. In the course of his address, he remarked that it would have been more appropriate to speak about the Holy Spirit in the very place where the Pentecost Spirit descended upon the apostles, namely "in the Upper Church of the Apostles. "35 By this time the Judeo-Christian synagogue on Mt. Zion had become known as the Church of the Apostles. It became known as the Church of the Apostles not only because the apostles returned there after witnessing Christ's post-resurrection ascent to heaven, but also because the building was built, as we have seen, under the leadership of Simon son of Kleophas. Kleophas was known as a brother of Joseph of Nazareth,36 therefore Simon was a cousin of Jesus. Simon was later considered one of the apostles, outside the circle of the 12. For this reason, the house of worship built by Simon could rightfully be called the Church of the Apostles. At this point, it becomes clear why Cyril, the bishop of the gentile Christian community of Jerusalem, did not preach in the Church of the Apostles, although he acknowledges that that would be the more appropriate place to talk about the Holy Spirit. He did not preach at the Church of the Apostles because this church was a synagogue in the hands of Judeo-Christians, as we deduced from the Pilgrim of Bordeaux. At this time Judeo-Christians and Gentile Christians had already separated. But how could a Judeo-Christian community exist in Jerusalem from the second to the fourth century? After the emperor Hadrian suppressed the Second Jewish Revolt against Rome in 135 A.D., Jews were banished from Jerusalem by imperial decree. Whether this included Judeo-Christians is not clear. The revolt had been led by a man named Bar-Kokhba, who made messianic claims of his own � the revolt is sometime called the Bar-Kokhba Revolt. Naturally, Christians of Jewish descent opposed these messianic claims, thus incurring the wrath of Bar-Kokhba's followers, so perhaps the Judeo-Christians were not required by the Romans to leave Jerusalem. Or perhaps, after Jerusalem was rebuilt as a Roman city named Aelia Capitolina � to obliterate any associations with the Jews � and Hadrian was succeeded by a much milder emperor named Antoninus Pius (138-161 A.D.), the Judeo-Christians drifted back to Mt. Zion. Their adherence to Jewish customs, especially circumcision and observance of Jewish holy days, naturally alienated them from the church of the gentiles. The fissure became a gaping canyon with the strongly anti-Judaic positions taken by the Byzantine church after the Council of Nicea (325 A.D.). 37 The church fathers (Eusebius, Epiphanius, Jerome and others) called it "a cottage in a cucumber field" (MPG 22, p. 43-44; Baldi, Enchiridion, nos. 733, 734). 38 G. Pasquati, ed., Seconde Lettre (Berlin, 1935), pp. 11-17. 39 MPG 41, p. 845. This dispute, especially as it relates to Mt. Zion, is referred to in a letter from the church father Gregory of Nyssa, who visited Jerusalem in 381 A.D. Gregory reported that the very place that was the first to receive the Holy Spirit was now in turmoil, and that a counter-altar had been set up.38 Bishop Epiphanius of Salamis also declared that Mt. Zion, which was once a privileged he height, had now been "cut off" (as heretical) from the rest of the church.39 This was the situation during the second half of the fourth century A.D.
To fend off gentile influence, both pagan and Byzantine (that is, gentile Christian), the Judeo-Christians of Mt. Zion built a wall around their ancient sanctuary. It was this kind of ghetto wall that the Bordeaux Pilgrim referred to when he visited Mt. Zion in 333 A.D. He entered and exited through a wall, he reported. How the Byzantine Christians finally took possession of the ancient Judeo-Christian sanctuary, we do not know when. But in 1984, Belgian scholar Michel van Esbroeck published some texts, recently discovered in a Georgian monastery in Russia, that seem to answer at least this question. In one of these texts a certain bishop, John of Bolnisi, records that the feast of dedication of the Anastasis (a circular structure built over Jesus' tomb as a memorial of his resurrection) occurred on September 13, whereas the nearby Constantine church of the Martyrion was dedicated on September 14 and the Church of Hagia Sion (Holy Zion), the mother of all churches on Mt. Zion, on September 15. 40 Michel van Esbroeck, Les plus anciens homiliaires Georgiens (Louvain, Belgium, 1975), PP. 314-315. So the construction of the first Byzantine church on Mt. Zion was ordered by Theodosius 1, who reigned between 379 and 395 A.D. This emperor also had built the first Byzantine church in Gethsemane. The structure of the apostolic synagogue was left untouched, however. The new church simply formed a kind of vestibule to the ancient structure. This we know from the famous mosaic in the apse of the Pudentiana church in Rome, which was made about 400 A.D. This mosaic not only shows the Church of the Holy Sepulchre but also the two buildings on Mt. Zion next to each other. The reconciliation between Judeo-Christians and gentile Christians of Jerusalem was brought about by an illustrious person of this period, Saint Porphyrius, later bishop of Gaza. He himself seems to have been of Jewish descent. He came to Jerusalem from Thessalonica and may have become a monk on Mt. Zion. In any event, he was a great preacher who succeeded in integrating the Judeo-Christians into the imperial church. Prior to this the two groups had lived physically apart and intellectually aloof from one another. 41 van Esbroeck, "Jean II de Jerusalem," Analecta Bollandiana 102 (1984), pp. 99-133.
g See James F. Strange and Hershal Shanks, "Has the House Where Jesus Stayed in Capernaum Been Found?" BAR, November/December 1982. 42 Baidi, Enchirdion, no. 734. 43 Baldi, Enchiridion, no. 732. 45 MPL 41, P. 813. 46 From this time on, this building is often called in Greek the diakonikon, that is, a side chapel of the Hagia Sion church. From both the text of Bishop John's sermon and the Pudentiana mosaic, I am inclined to agree with van Esbroeck that the Byzantine vestibule church, adjacent to the Church of the Apostles, was built as an octagon. The octagonal form was used for Christian memorial churches, in this case a memorial to the mother of all churches, the Church of the Apostles. Other examples of octagonal memorials are the church memorializing Saint Peter's house in Capernaum, which has in large parts survivedg and the Constantinian sanctuary built above the grotto of Jesus' nativity in Bethlehem. To enhance the attraction of the Theodosian building, the presumed column of the flagellation of Jesus, which so far had been lying in the ruins of the house of Caiaphas, was inserted into the portico.42 Crowds of people came to venerate this column on Good Friday morning, according to Egeria, an intrepid female pilgrim who visited Jerusalem around 394 A.D. From her description of the liturgy, there was a double sanctuary on Mt. Zion,43 the old Church of the Apostles and the Theodosian Church in front of it. It seems as if on Pentecost the people gathered in the newly built church of Theodosius, while the presbyters (ordained priests) went also to another church, apparently the ancient Judeo-Christian synagogue. One gets the same impression from a moving passage in Bishop John's dedication sermon, where he exhorts the builders, priests and architects to go to the Upper Room. After the reconciliation with the original Judeo-Christian owners of Mt. Zion and their absorption into the gentile church, John was free to conceive a great plan of reconstructing Mt. Zion and adding the great church of Hagia Sion. To realize this grandiose scheme, a monk's vision came to his aid. Based on this interpretation, the relics of Stephen were solemnly brought in a great procession into the sacrarium of Mt. Zion, that is, the old Judeo-Christian synagogues.46 The date of the transfer of St. Stephen's bones was December 26, 415 A.D., and this became the date of the feast of St. Stephen. Of Judah stood on this hill, two more memorial tombs were added in the tenth century, one for David and one for Solomon. It was these two tombs, plus St. Stephen's sarcophagus that the Crusaders found upon their arrival, as we have seen above. The Church of Hagia Sion was burnt during the Persian invasion of 614 A.D. It was rebuilt by Patriarch Modestos, and partially destroyed again in 1009 A.D. by Hakim, the Fatimid sultan of Egypt. So, when the Crusaders arrived in Jerusalem in 1099 A.D., they found the magnificent Byzantine Church of Hagia Sion in a heap of ruins. On the south part of the ruins of the Hagia Sion, the Crusaders in the 12th century built a new church, which they named St. Mary of Mt. Zion, in memory of the tradition that Mary had lived on Mt. Zion after the resurrection of her son and had also died there. In 1985, while a sewage channel was being dug in front of the Dormition Abbey, I took the occasion to examine the area archaeologically and was able to locate the foundation of the facade of this Crusader church. The southwest corner of the church is in an exact alignment with the southern wall of the building of the ancient Judeo-Christian synagogue (see Crusader remains). The bases of nine Crusader pilasters and the western section of the northern wall of the Crusader church were also discovered and preserved. Thus, it was the Crusaders who first included the walls of the ancient Judeo-Christian synagogue, which had become the Church of the Apostles, into their own basilica. As the Madaba map clearly shows, even the big rectangular Byzantine Hagia Sion was separate from the remains of the older Church of the Apostles. Above the remaining walls of the Church of the Apostles, the Crusaders built a second floor. The room on this floor, known as the cenacle, commemorated both the Last Supper and the Pentecost event described in Acts 2. This may have been the actual site of the Upper Room, referred to in Acts, where the Last Supper was held. This room is still visited today by Christian pilgrims. On the lower floor, next to the pseudo-tomb of David, the Crusaders commemorated the place where Christ washed the feet of his disciples (John 13:1-20). 47 Baldi, Enchiridion, no. 763. 48 The Syrian Christians transferred the traditions of Mt. Zion to the church of St. Mark near the Armenian quarter, which they venerate also as the cenacle. Near the end of the Crusader period, a travel account written in Hebrew by a Spanish Jew named Benjamin of Tudela (1167 A.D.) directs us to the "Tomb of David" on Mt. Zion. Benjamin relates that during his stay in Jerusalem, a Jew named Abraham told him a fantastic story. While employed by the Christian patriarch to reconstruct a damaged monument on Mt. Zion, two Jewish workers accidentally happened upon a secret passage and suddenly found themselves in a palace made of marble columns � the tombs of David and the Kings of Israel! A golden scepter and golden crown rested upon a table. There were riches all around. Suddenly they were struck down by a fierce whirlwind and began to hear voices telling them to leave immediately. Frightened, they crept back through the secret passageway, out into the open. 49 Baldi, Enchiridion, no. 760. As fantastic and confused as their story may sound, it became the basis of Jewish folklore concerning the tomb of David. Soon the local Moslems also accepted the site as authentic. Between 1335 and 1337 A.D. the Franciscan fathers, who had just recently arrived in the Holy Land, purchased the site on Mt. Zion from the Saracens. The king of Naples served as an intermediary in this affair. Thus Mt. Zion became the first convent of the Franciscans in the Holy Land. Since then the Franciscans have been entrusted with the care of the holy places. To this day the Superior of the Franciscans carries the title Custos Sancti Montis Sion, "Custodian of Holy Mt. Zion." The Franciscan friars repaired the roof of the cenacle (the Upper Room) in the 14th century, strengthening it with a gothic rib vaulting. South of the cenacle they built their new monastery (Mt. Zion Monastery) in the center of which was an open court surrounded on three sides by the cloister. It can still be seen today. Apparently the Franciscans were never able to occupy the tomb of David on the ground floor, however. There Moslem holy men had made their abode. Indeed, local Moslems pleaded with the authorities to remove the infidels from the upper floor of the tomb of Nabi Dawood (the prophet David). These pressures became even more intense during the Turkish period. By the middle of the 16th century, the Franciscans were violently forced to abandon Mt. Zion completely. In order to hinder their return, both David's tomb and the cenacle were declared mosques. A prayer niche (mihrab) was inserted in the wall indicating the direction of prayer toward Mecca. It was exactly opposite the orientation of the niche of the first century Judeo-Christian synagogue-church, which pointed to the Holy Sepulchre. Since 1948, Mt. Zion has been part of Israel. The government's Department of Religious Affairs now administers both floors of the building. The pseudo-tomb of David is used as a Jewish synagogue and the upper room is left open for Christian visitors. Unfortunately, the only archaeological exploration of this very important site was the cursory examination by Pinkerfeld. Perhaps one day it will be excavated more thoroughly. In the meantime, we may venerate it as Christendom's most ancient shrine: The mother of all churches. Subscription price is $27.00 per year in the United States, $33.00 elsewhere. �2000-2003 CenturyOne Foundation, Inc.� a Nonprofit Organization All Rights Reserved. All materials contained in the CenturyOne Foundation Web Site are protected by copyright and trademark laws and may not be used for any purpose whatsoever other than private, non-commercial viewing purposes. Derivative works and other unauthorized copying or use of stills, video footage, text or graphics is expressly prohibited.